On a visit to Brussels, the former CIA chief took a swipe at European critics who accuse the US of undermining global institutions, insisting President Donald Trump is restoring America's traditional leadership role. "Bad actors have exploited our lack of leadership for their own gain," Pompeo told a gathering of diplomats in the European capital. "This is the poisoned fruit of American retreat. President Trump is determined to reverse that." Pompeo's speech came as NATO foreign ministers meet to discuss the latest tensions with Moscow after a naval clash between Russia and Ukraine and with a landmark Cold War arms control treaty hanging by a thread. But Pompeo said Washington was simply taking action to either improve or terminate "outdated or harmful" agreements that did not serve the interests of the US and its allies. "We are rallying the noble nations of the world to build a new liberal order that prevents war and achieves greater prosperity for all." He accused China of cynically exploiting WTO rules to unfairly advance its own economic interests and launched a stinging attack on the ICC, which he said was "trampling" on the sovereignty of independent countries. "Every nation must honestly acknowledge its responsibility to its citizens and ask if the current order serves the interests of its people as well as it could -- and if not, we must ask how we can right it," Pompeo told diplomats at the German Marshall Fund thinktank in Brussels. "This is what President Trump is doing. He is returning the United States to its traditional central leadership role in the world." 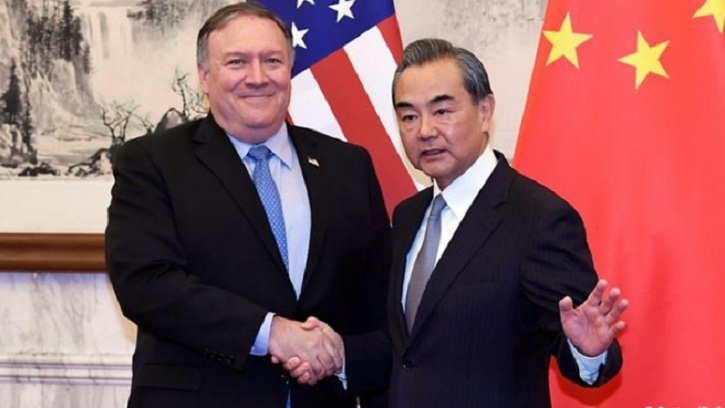 While US criticism of China, Russia and Iran is not unusual, Pompeo also fired a salvo at America's allies across the Atlantic. There has been anger in Europe at Washington's abrupt withdrawal from the Iran nuclear deal -- derided by Trump as a failure but still cherished by many in Brussels as a crowning achievement of EU diplomacy. "Even our European friends sometimes say we're not acting in the world's interest. This is just plain wrong," Pompeo said. And in another remark likely to raise hackles among EU officials, he said Brexit raised "valid questions" about whether the bloc was really putting "the interests of countries and citizens... before those of bureaucrats here in Brussels".